Last week marked a series of firsts for me: attending my first concert AC (after children), confusing said concert with Cirque de Soleil, and finally, meeting the one and only P!NK, née Alecia Moore. I had been expecting some impressive acrobatics during P!NK's The Truth About Love concert simply based on the reactions of fellow P&G mom bloggers who had previously attended her concert. But nothing could truly prepare me for the awe-inspiring performance of such a talented woman, mother and COVERGIRL. From being suspended from a rotating sphere in mid-air to refraining from dropping the F-bomb given the number of children in the audience, I suddenly found myself harbouring deep respect for the artist. Perhaps it was her piano solo that did it for me. Or her incredible voice. Or maybe it was her final performance which found her soaring to new heights in glamourous fashion. You need not adjust your screen. She is indeed wearing flashy stilettos in this video. While I will never be as fit or look as gorgeous as P!NK, I did have a little help from Pantene and COVERGIRL. I have been trying to grow my hair ever since I cut it on the day that I met Oprah. It's not that I didn't like the cut. I just didn't like it on me. Short hair suits P!NK so much better! In the meantime, I find I have to blow dry my hair if I want it to look half-decent. Luckily, I have the new Pantene Pro-V Heat Shield collection to help protect my hair from the ravaging effects of flat irons and blow dryers. For makeup, I used COVERGIRL’s Ink It! by Perfect Point Plus Eyeliner, their new Flamed Out eye products and COVERGIRL Smoochies for lip colour. 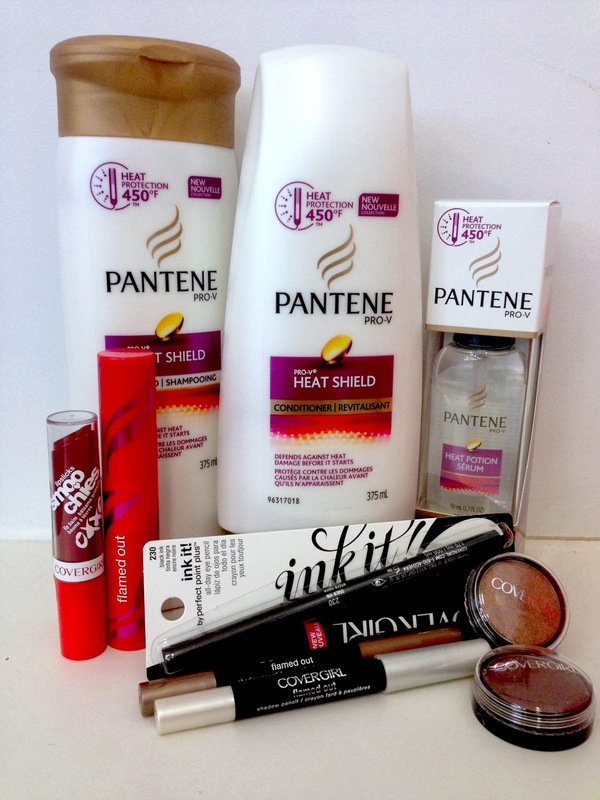 By entering the following contest you are accepting that, if you win, your contact information will be shared with a P&G PR and shipping agency for the purpose of mailing your prize. Please allow 4-6 weeks from the contest closure date to receive your prize. The pots are cool! And BTW... thank you! You're too kind! Definitely the Flamed Out black mascara - I love mascara! I would most like to try the Pantene Pro-V Heat Shield Conditioner. I'd like to try the Smoochies! I would most like to try the Pantene Pro-V Heat Shield Potion Serum. Yes! It was pretty neat meeting her backstage but I was totally blown away by her performance. She is amazing! I would love to try the Flamed Out Mascara. I'm not a huge fan of Pink. I like some of her stuff, but I've always thought she would be soo energetic to see perform. The mascara -- I love CG mascara. I ONLY use Pantene hair product, especially for treated hair. Love CG products, especially mascara. Would like to try the other products! You look fab Diana.....so jealous! I've seen her a couple times but never had the pleasure to meet. Aw, thanks Ana! Pink's concert was really impressive and I was pretty lucky to have met her. Melted Caramel pots but I am so jealous! Pink is my favorite female artist!! Smoochies! What a cute name! The Pantene Pro-V Heat Shield Shampoo because I love trying out new shampoos and I heat style my hair quite a bit! The Cover Girl Flamed Out Mascara. I need all the help I can get! Can't wait to try Pro-V Heat Shield Potion Serum. All the blowdrying and styling aids makes hair dry during the winter. Perhaps it will protect my dry hair! 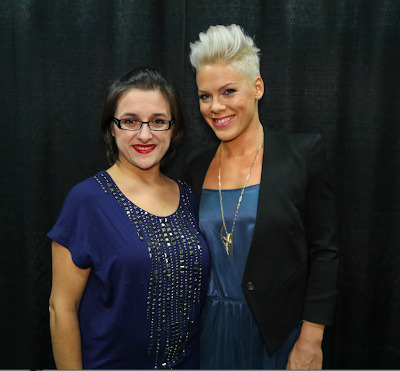 The smoochies...what an amazing opportunity to meet Pink!! I'd like to try the Melted Caramel pot. I'm always buying eyeshadow in shades I think I'll use (purple, grey, general weirdness), and then never use them. This is one that I think would work. i love pink!!! Love to try the mascara! I can't wait to try the conditioner! I'm excited to try the COVERGIRL Smoochies. I love lip products! I am most excited to try the COVERGIRL Scorching pots, either colour. I'm most excited to try the serum. I'm excited to try the COVERGIRL Crystal Flame pencil! All of them. but not gonna lie, I'm particularly intrigued by the scented razors. I'm excited to try the Pantene Pro-V Heat Shield Potion Serum! For me it's the Heat Shield Shampoo, but I would love to win this for my wife. I'd like to try the heat shield potion serum. Can't wait to try the Pantene Pro-V Heat Shield Potion Serum! I'm most excited to try the Pantene Pro-V Heat Shield Shampoo (and conditioner). I'm interested in trying the Smoochies. I'm looking forward to trying the mascara - I'm looking for a new one. I'd love to try the COVERGIRL Flamed out mascara black. I never leave the house without mascara on! I would love to try the Smoochies! Pantene Pro-V Heat Shield Conditioner. The Pantene Pro-V Heat Shield Conditioner as I have dry hair. I am most excited to try the Cover Girl Flamed Out Mascara! I would definitely like to try the Flamed out mascara. Fab! It was pretty neat to meet her but I was so amazed by her concert performance. She was incredible! Pantene Pro-V Heat Shield Conditioner I use my hair irons a lot more than I ought and this would be great! i want to try the mascara and smooches! Pantene Pro-V Heat Shield Potion Serum is a definite must try for me! Definitely the Ink It eyeliner!! I love your photo with PINK! She's an amazing singer and I own her albums. Even my 4 year old son sings along with her when she's on in my car.